Tribute to Mono -Ha at the Cardi Gallery includes seminal works by ten artists, many of the works showing in the United Kingdom for the first time. In addition the exhibition includes archival photographs and videos capturing key moments in the history of the group. Mono-Ha appeared in response to the unrelenting industrial development of Japan and in particular of Tokyo in the mid 1960s. The label was given to the loose group of artists at a later date by art critics. Though Mono Ha is translated as the School of Things, there is no direct equivalent for the word Mono. It can equally mean thing, matter, material and object. The initial focus of the group was to move away from things as used in minimalist art. The artists responded by ‘not making’ in their search for the essential. The message of the Mono Ha artists was not simply in the works themselves, but in the artists’ desire to root their work in materiality and push back against the supremacy of idea over matter, the artist pointing the viewer to the thought that the material holds the message. Abandoning traditional art materials, the artists focused on easily available materials, both natural and industrial and presented these without undue elaboration. Much of the innovation came from the manner in which they combined and juxtaposed the elements in their work. Lee Ufan, founding member of Mono-Ha and philosopher, refers to this as encounters. The unexpected relationships between materials, between objects and space, between the body and the elements question modernisation and industrialisation at the expense of nature. Paradoxically, the simplicity of the works produced by Mono-Ha artists belonging makes the meaning of the pieces more difficult to decipher. 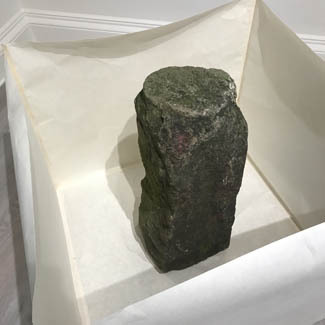 Some like Phase - Mother Earth (1968) came about almost by chance, the development of the work coming from Nobuo Sekine’s desire to work with the materials rather than imposing a plan on them. 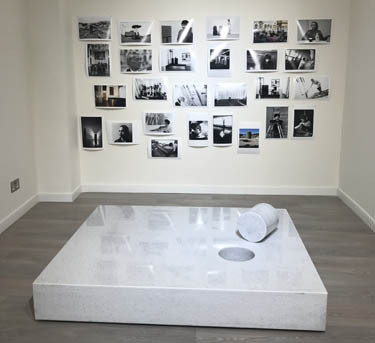 This work by Nobuo Sekine references his seminal piece Phase – Mother Earth of 1968 in which a large hole (3m deep with a diameter of 2m) was dug. The excavated earth was into a pillar mirroring the hole. The work developed almost by accident, without much conceptual planning. This exhibition has encouraged me to reconsider the materials I use in my own work. I frequently use found objects and am naturally attracted to materials such as metal and wood. The yarns I include in my work are usually linen, wool and cotton which I feel best communicate my exploration of our place in the world through skills and objects. I have been challenged to collect objects that I find unattractive rather than the ones I am instinctively drawn to. This has led me to question what and how I chose to work with. Tribute to Mono-Ha has rekindled my interest in aesthetically pleasing materials. The task now is to delve deeper into the why. Groom, S. (2001) Mono-ha – School of Things. Cambridge: Kettle’s Yard. Material experience connects us to our fellow human beings. An object embodies stories and carries not only the memories of its own history, but may offer a refraction of the viewer’s life story. ‘Objects inscribe the memory of previous generations’. (Smith quoted in Adamson 2018, 108) Objects ground us in our everyday lives and act as reminders of our shared humanity. Material awareness reminds us that the physical world is as networked and interconnected as is the digital world. Artists Consuelo Simpson and Celeste C. da Luz bring together a mixed media show to challenge the idea through using a variety of medium and objects. Consuelo’s work Nexus evokes the interconnections of objects and histories. Objects held within the meshwork invite the viewer to animate the piece. Seeing her work as a dialogue, Celeste provides an opportunity for both works to communicate and react with each other. Both works aim to go beyond the recognisable connotation of the material itself through the viewer’s imagination and personal experience. Bennett, J. (2010) Vibrant Matter: A Political Ecology of Things. Durham: Duke University Press. Schwabsky, B. (2016) The Perpetual Guest. New York: Verso. Celia Pym came to UCA Farnham and gave an entertaining and informative illustrated talk about her practice. She explained how the gift of a much worn and repaired jumper which had belonged to an uncle brought her to consider damage and repair. Damage reveals the actions of the body, particularly oft repeated actions while the repairs are small acts of attention and care. Pym uses contrasting colours to effect her repairs. Using darning stitches, rather than knitted patches, which make no effort to blend into the original fabric of the garment, she favours ‘meaty repairs’. Pym follows her instincts in making, questioning as she goes ‘is this working?’. Her practice is very much process le. There is a parallel need to be brave on occasion, however much time and effort has already been invested in the work. Pym described the moment she used a pair of scissors to flail open a pair of knitted legs and socks in which she had already invested many hours of work and the resulting liberating realisation that this was a productive act, possibilities. The lesson here is to stop, look and take action, even radical action, if the work needs it. Where holes happen was selected for the final of the Woman’s Hour Craft Prize 2017 and exhibited at the V&A. Pym spoke movingly of the time spent in conversation, talking through an object, with a retired GP before the orange sweater was selected for the work. Handwork brings the object and the artist physically close and allows memories or connections to emerge. The garments show evidence of the life of the wearer. This is very much how I feel about working with the second-hand tools which make their way into my work. It is the human associations which are valued. The retrospective gathers together works spanning 40 years. 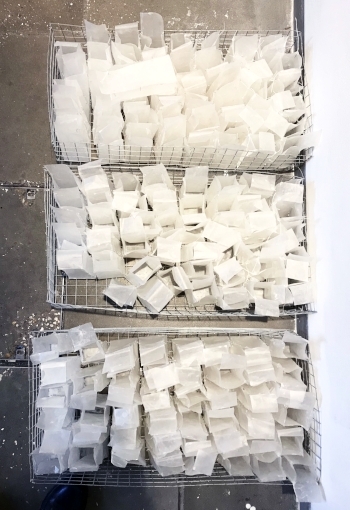 Caroline Broadhead trained as a jeweller though her practice since has encompassed many disciplines including sculpture, textiles, jewellery, installation,performance, photography. Broadhead says of her work ‘...(it is) mainly driven by ideas but making and materials are an integral part of the process. You can’t make things without considering the craft of it’ (ND marsdenwoo.com) The ideas often span several works but at every turn the viewer is aware of the making and construction of each object. Broadhead’s practice is driven by ideas made concrete in a range of materials and scale. 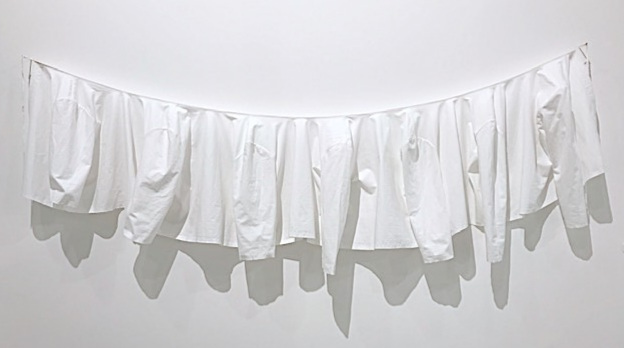 The scale is playful and the form may be distorted, items of clothing are stretched and elements elegantly multiplied in a manner which suggests small repeated gestures. Many of the pieces in the show are designed to be worn on the body and at the same time offer much more. A nylon filament artefact in a display case suggests a bracelet - on the body it becomes a sleeve. Broadhead is concerned with edges of things and people. The Wobbly Dress questions how a body might fit into the dress and simultaneously the dress interrogates the space beyond it. Several pieces on display incorporate judicious use of shadows adding an element of theatre to the curation. The edge of the chair is partially lined with white foam (draught excluder possibly?). When viewed from a distance, the broken white line appears to encase the whole chair. Its companion piece, on the other hand, has been sanded bare and has been completely de-surfaced. The flailing, though no trace of violence remains, suggests vulnerability. Broadhead’s practice of carrying an idea through into several iterations is something I would like to pursue in my own work. This offers the opportunity to more fully explore an idea by investigating the possibilities offered by the developing work. The exhibition at the Whitechapel Gallery stands up to its title. The objects are bizarre and beautiful, the viewer is attracted and confused. What is real, what is imagined, what is the message? Delicate mushrooms fashioned from velvet, frightening papier maché flowers, larger than life but perfect botanical models, animated by a coloured light show and the skull of a tuna fish, every bone marked and named jostle for space in the dark space. Is their role to entertain or to inform? Made to inform and to teach mostly in the 19th century, in the days when preserving tissue was difficult, these objects have lost their purpose. This adds to the uncertainty surrounding them. The viewer cannot but marvel at the skills of their creators and yet be repulsed at the same moment. Freud’s unheimlich has come to town, horror is its shadow. 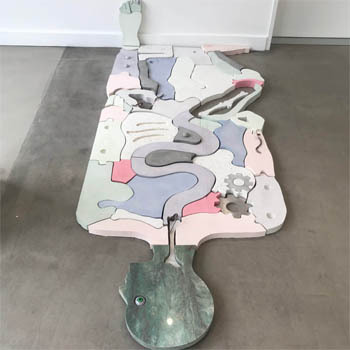 The artist Salvatore Arancio has curated the show and included some of his work among Loudon’s collection, adding to the feeling of dislocation. Is it art? It is enough that it makes you think and wonder. Giuseppe Penone’s solo show at the Yorkshire Sculpture Park, A Tree in the Wood, is his biggest to date in the country. and yet visitors to the Underground Gallery are immediately confronted by a brutal intervention. By making a steel cast of his hand and forearm and attaching this to the trunk of a young sapling, Penone has impeded the growth of the bole at that point. 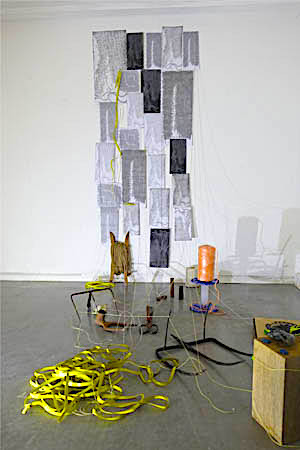 Trees feature repeatedly in Penone’s practice. There is a poetic feel to many works, counterbalanced by an undercurrent of menace. In To breathe the Shadow the cast of the artist’s hand, set against a wall of laurel leaves held in cages, is pierced by a bronze cast of foliage. The materials he uses, which include stone, bronze, thorns, drawings, films, are not all immediately associated with the lightness of touch he achieves. 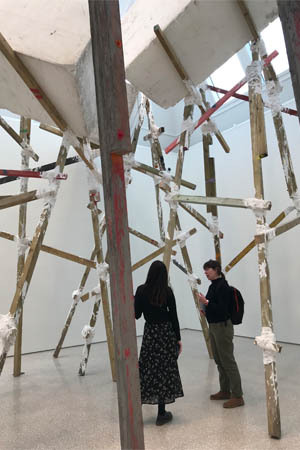 Associated with the Arte Povera movement early in his career, Penone has continued to explore the links between man and nature and to use durable materials rather than technology. Penone is not completely resistant to new technologies but favours materials which have stood the test of time and will not become obsolete as culture moves forward. He is nonetheless aware of the changes that his chosen materials will undergo over time, such as the patination of bronze. He also considers the universality of the materials he chooses. He uses materials to illustrate the transience of human life and by inserting a trace of himself in the work also highlights the effect of human activity on nature. The most spectacular work in the Underground Gallery must be Matrice, a 30 foot tree trunk meticulously hollowed out following the line of a single growth ring. At one end, a bronze cast of the interior of the tree in the round reminds us of the tree’s past as a living being while alluding to the human body and more particularly to the vascular system, challenging the boundaries between man and nature. There is so much to take away from this exhibition, the deceptive simplicity of the works, the considered use of materials and the use of scale and the overriding frisson of dread while I wallowed in the restrained beauty of the works. Size does not necessarily equate with emotion. If you see a small flower alongside a large sculpture, you might dwell on the flower. Beyond Time is a site-specific work installed in the Chapel at the Yorkshire Sculpture Park (YSP) by the Japanese born artist Chihura Shiota. Her large-scale works include The Key in the Hand, selected to represent Japan at the Venice Biennale in 2015. It took 12 people 12 days to complete the installation at YSP. Shiota more usually works in black or red but in this instance the chapel demanded white, the colour of mourning in Japan, signifying also purity and the eternity that follows death. “I see [death] as a new beginning, not an end” (Shiota). Beyond Time references the history of the chapel and the people who celebrated life events in it. A steel sculpture echoing the outline of a piano represents the music and songs which no longer fill the space. Captured in the delicate web of threads are photocopied pages of programmes, sheet music and bell ringing schedules taken from the YSP archives. The overall effect of the work is ethereal and delicate though on closer scrutiny, the white string is coarse and the photocopies rough and ready. Also on show on the walls upstairs are 4 drawings, oil pastels and threads in largely in muted tones of grey and enlivened with red. The figurative works suggest delicate bodies enveloped by a pulsing life force. Because much of her work takes the form of temporary installations, Shiota is currently exploring the lasting medium of bronze and is exhibiting Belonging, a sculpture of a woman’s and a man’s hand and forearm cradling a child’s. The work emphasises that more connects us than divides us. The film Wall, shown in a small alcove on the ground floor is mesmerising and disturbing. Shiota is seen lying on the floor, entwined in tangled tubes reminiscent of intravenous drips. A red liquid pulses through the tubes to the hypnotising sound of a heartbeat. 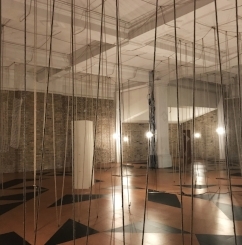 This moving piece is a reminder that Marina Abramović and Ana Mendieta were both teachers and inspirations at the start of Shiota’s career as a performance artist. Tacita Dean inaugurates the Gabrielle Jungels-Winkler Galleries at the Royal Academy with a show exploring Dean’s notion of landscape. The exhibition opens with the chalk drawings on blackboard and slate. An entire wall is taken up with the monumental chalk drawing of snow and ice-covered mountains. The scale is magnificent, the scratchy marks on the surface are very human. The undeniable beauty of the work obscures the danger inherent in the far reaches of the world and in many natural phenomena. The title of the drawing, Montafan Letter, refers to the description of a series of avalanches which occurred in the Alps in 1689. The first avalanche buried a village, the second coincided with the funeral held for the dead, while the third miraculously uncovered the officiating priest. 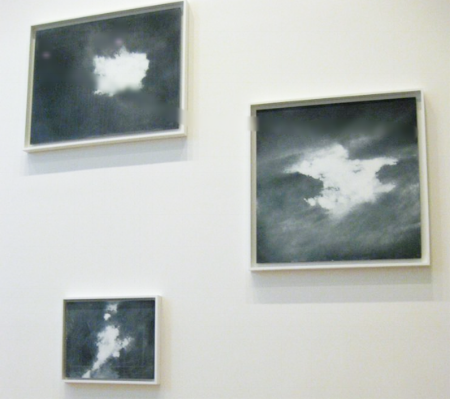 The smaller, more intimate and minimal slate drawings of clouds are to my mind the most successful. The marks and the titles suggest clouds, but could as easily be thoughts or inner landscapes. The short phrases, words seemingly left behind, suggest half thoughts or notions half remembered. The balance between the slate and the chalk is all. The representation of a shaft of light piercing the clouds is breath-taking. Also known as a film maker, Dean’s handling of light should not surprise. There is a sense throughout the exhibition of Dean’s awareness of the history of art. The spirit of Constable, lover of clouds, is close. The arrangement of the slate paintings across three walls is intriguing, ignoring the eyeline, allowing each piece to be alone within the whole, the final small work set high up, like a balloon drifting away. Dean has included a David Nash watercolour in the exhibition. Like Nash, Dean is a collector of stones. A beguiling collection of round stones of various tones and hues is presented on a large square plinth. Here is the earth, set below the sky. The careful placement of these inherent engaging objects allows them to play off each other. The smaller ones would fit comfortably in the hand or pocket while the larger ones call to mind early cannon balls. Only the acrylic case saves them from being disturbed. The impressive collection of delicately fading clover leaves by contrast appear weighed down by the heavy display case. How big a role does chance play in Dean’s practice, in life? Dean’s versatility shines through as she tackles landscape in its broadest sense. In this exhibition, Dean’s focus has zoomed in and out, observing from afar and offering up small details. As I explore the notion of what it is to connect with place, the idea of collections merits further exploration. Why collect, what does a collection of found objects achieve in the studio or on display? Is the title the best thing about this exhibition? The phrase was used by migrants as a toast in the 18th and 19th centuries - looking to a hope filled future in their adopted land and remembering the country they left behind. The title promises much, the exhibition delivers rather less. Hauser & Wirth Somerset website announces that the show, curated by Adam Sutherland of Grizedale Arts ‘features over 100 international artists and creatives … and tells the story of humanity’s evolving connection to the land, our perception of, and reliance upon it.’ The exhibition explores how humanity has made use of the land and how our relationship with it has developed. 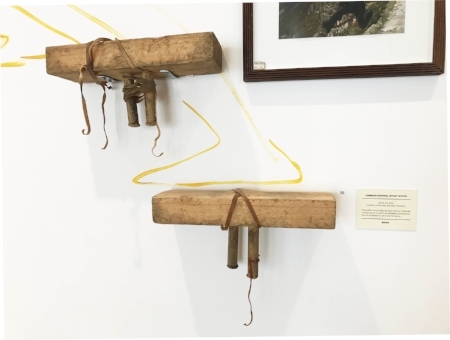 The show is installed both indoors and out, consisting of a bewildering range of elements, historical and contemporary, and includes everything from agricultural artefacts to drawings, paintings, prints, installations, assemblages and film. Every media is covered. Perhaps this is part of the problem. There is too much to take in, too many ideas are alluded to but all too briefly with no clear narrative to help visitors navigate the rooms. Perhaps visitors lucky enough to be present during the many practical presentations and the participatory projects running alongside the exhibition were able to engage with artists and participants and benefited from a necessary degree of insight. Society’s current discrepant connection and confused attitude to the countryside and to food production is laid bare. One wall text claims that ‘our interaction with the rural has evolved, but not really changed’. It can be argued instead that a great proportion of the general population has grown more distant from and now lives in total ignorance of the realities of the countryside and has no awareness of the actuality of rural life. Items as disparate as Marcus Coates’ Stoat Stilts, created for a performance in which the artist imitated animal behaviour in an attempt to get closer to nature and a long handled ragworth puller measuring at least one metre, by way of a 17th or 18th century Korean Dragon Jar need more to knit them into a coherent narrative than a series of interpretive wall drawings by Fernando Garcia-Dory. The same can be said of the vitrine filled with a diversity of archival documents and objects, which include a farmer's smock, an engraving of Druids celebrating at Stonehenge and a Bernard Leach tankard. The display, liberally sprinkled with bronze casts of British wild mammal droppings (Marcus Coates), is more baffling than illuminating. It is difficult not to regret the absence of significant supporting literature. A Grayson Perry map is hung above a doorway and is impossible to decipher. A laminated A3 copy of the map left on the window sill does little to help remedy the situation. The exhibition ends on more a positive, if somewhat romantic, note. In complete contrast, the final room is filled with books and with information from a variety of organisations running rural themed projects in urban areas. Though this is highly encouraging, these schemes bring to mind Baudrillard’s Simulacra and Simulations. All residents of the local area are invited to offer handmade goods for sale in The Honesty Shop. Buyers are asked simply to record the transaction in a ledger and to place the money in the honesty box. This arrangement sustains links between Hauser & Wirth Somerset and the community within which it is developing. Curator Adam Sutherland believes that making is part of an enhanced everyday life. It is difficult to disagree with this point. A Continuous Becoming is the first London solo show of Italian artist Giorgio Griffa (b. 1936). The exhibition, at Camden Arts Centre, includes works from the 1960s to the present. An awareness of the light and of the colours on canvas and an overwhelming sense of serenity are the immediate impressions on entering the gallery. The exhibition is immaculately hung. The presentation is simple, the canvases are pinned directly to the walls. The focus is directed to the works themselves. The canvas is unprimed and unstretched with torn, rather than frayed, edges. The top edge of each painting though is tautly stretched and the canvas hangs straight and flat against the wall. This is the first intimation of Griffa’s lightness of touch and illustrates his way of working with the physical quality of the materials in allowing them to do their thing. There is an absence of hierarchy between the elements. The artist does not command his materials, but rather works in tandem with them. These are not overtly emotional or gestural paintings. The confidence to allow the materials to simply be is meditative, even zen like. Despite the initial impression of simplicity, the works are evidently the result of a deep and thoughtful practice. The marks are calligraphic, measured, never rushed. Griffa states that the marks he uses are universal, these are marks that could be made by any hand. The marks of folds held on the cloth gives a subtle structure to the picture plane and is reminiscent of the modernist grid. Splashes and drips of watery paint enhance the celebratory nature of Griffa’s practice. Echoing the written page, markmaking frequently begins in the top left hand corner of the work. Griffa feels no compulsion to fill the entire surface. The unadorned and untouched material reminds the viewer of the Arte Povera movement which developed in parallel to Griffa’s own practice. In these paintings, the bare surface is not naked but rather filled with the promise of more work to come. Griffa’s interest in physics and mathematics is reflected in his paintings, which often include numbers. Griffa is in thrall to the Golden Section. There is a parallel here to Griffa’s own practice. The Golden Section is an irrational number whose final digit can never be reached. It is a number which is never complete. This strategy suggests a door left open to the next work. The artist’s practice is a continuous line and can be likened to an arabesque rather than a linear progression. Working with the unpretentious confidence of someone who understands the power of uncomplicated, Griffa describes much through the rhythm of the spare mark marking. It is an exhibition which cannot fail to raise the spirits. I am very excited to be exhibiting shortly as one of six invited artists in collaboration with the Rooftop Collective. The curator, Anna McNay, has written about the upcoming show and the premise behind it. A number of the pairs come together in their approach to the natural landscape. Jeremy Johns’ photographs and Susan Clare’s watercolour and acrylic paintings, share a reflective and muted palette, which brings depth to open skies and wide vistas, bathing viewers in a fragile light. Tom Owens’ photographs breathe a certain kind of familiarity, returning to the same location at different times of year, noticing nuances and transient – often manmade – objects, many of which could be the raw materials for Consuelo Simpson’s sculptures, combining found objects, yarn and wire, to reflect on the collision of rural, agrarian and urban society. Both drawn to the geometric shapes, patterns and lines in their everyday surroundings, Paul Clifford and Michael Wallner employ their photographic and digital media to celebrate beauty in the mundane and the abstract in everyday life. A concrete wall is seen as a canvas of colours, all decaying paint and rusty pipes; paving stones turn into confusing collages of colour and texture. Chris King’s photographs, capturing southern American landscapes, devoid of human figures, suggest deserted film sets and invite the viewer to imagine the unravelling narrative script. Judith Burrows, a photographer and filmmaker by trade, similarly uses locations from her work as the starting point for her mixed media canvases, incorporating fragments of music and maps, alongside isolated figures, creating a sense of dislocation and uneasiness. For this exhibition, she will create a new ‘narrative of location’, responding directly to one of King’s Arkansas liquor store images. The conversation between Toby Deveson’s black-and-white photographs and Annamarie Dzendrowskyj’s similarly monochromatic, small-scale oil paintings is one of mutual exploration and running headlong into the unknown; that ambiguous, grey area that hovers between presence and absence, between what is seen and what is not. While Deveson’s tools and history keep him firmly rooted in the world of the ‘real’, Dzendrowskyj completes that foray into the magical surreal. And finally, turning from the external landscape to the interior, photographer Graham Matthews and mixed-media artist and sculptor Lesley James examine psychological ideas of hidden truths – what lies beneath the surface or behind the face presented to the world. With ghostly prints, totems and rubbings of walls – physical markers of the boundaries that keep us apart – their collaboration seeks to merge approaches and methodologies to produce a new language of perception; a collaborative viewpoint. more of an avalanche is a group show running at the Wysing Arts Centre, Cambridge until 8 April 2018. Developed from events held at Wysing in the preceding year on the theme of Polyphonic, the show does indeed include many voices. So many in fact shown both in the gallery and the screening room, that it is demanding for visitors to give due consideration to all the works in one visit. 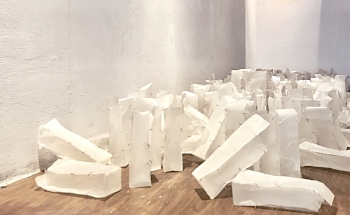 There is however no denying the unifying thread holding the show together, cutting through the undertones and emphases explored in the varied works. The disparaging term ‘snowflake’, much beloved of the right, is the hook on which the exhibition is built. Helen Cammock’s seemingly modest lino-cuts best encapsulates the show in its entirety. Divide and Rule Never (1978) and True Romance Etc (1982) by Isaac Julien and The Newsreel Collective anchor the premise of the exhibition in historical context, reminding visitors of the longstanding use of insults to make light of the protests of (largely) left wing dissenters. In contrast, further into the gallery, more recent works signpost the contemporary belief in the power of numbers, as evidenced by the #metoo campaign, alongside the emergence of an optimistic willingness to embrace differences and to accommodate the other. In the first photograph of Adopting a Father (2015-) the human figure is absent: the image shows a stripy top forlornly draped over an empty chair. 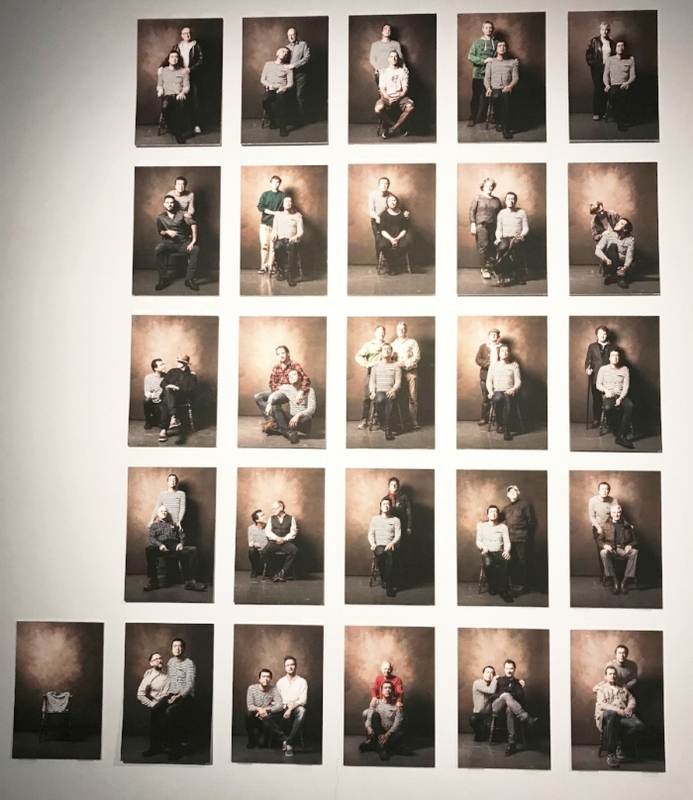 The remaining 25 photographs are displayed as a grid and all include the artist and at least one other person. Throughout his practice, Ilker Cinarel has explored the themes of men and masculinity. In the same year in which he began Adopting a Father, Cinaral produced Closer (2015) in which he reimagined a new relationship with his father. In the piece showing at Wysing, Cinarel also (re)constructs his past. Using painful memories as a stimulus for creativity, he stages (re)presentations of archetypal father and son love. In response to adverts placed in his local area for a temporary father, the artist invited respondents to a photo shoot. Cinarel and the strangers were photographed in a simulated photographic studio. This is a conceptual photographic work in which the outcome was unknown. The formality of the setting highlights the varied emotional responses. Some participants appear relaxed, others uncomfortable and tense. The work appears to question not only the nature of the father and son relationship but also to highlight the plastic role of the father figure and the fluid character of the concept of family. Physical contact, the gaze (between people and between people and the camera) and the absence/presence of love are all questioned. Without the interactive elements and social media campaign which ran alongside the making of the work, the viewer now is required to draw more deeply into their personal experience of the parent-child relationship and is invited to reflect on the making of new memories. As with many good exhibitions, more of an avalanche is a show that leaves visitors with more questions than it answers and with more questions than they arrived with. It is time to stop making, experimenting with presentation and to stand by a decision. An opportunity to take the work out of the studio is most welcome. Putting work into a public space creates a very different dynamic to playing with curation ideas in the safety of the studio and will often lead to more ideas for display or about the very nature of the work. It is always helpful, if at all possible, to get a feel for the gallery space during the planning stages and to gauge the local audience. In the case of the Linear Gallery, it is long and narrow as well as being a main thoroughfare. What I am describing is in effect a busy corridor! This has implications for the safe placing of work and the safety of those using the space. There was the possibility of using an outside courtyard for display. From earlier experiments, I know that the vessels can look lost without a strong, possibly geometric, element to work against and that arranging the elements ‘haphazardly’ soon looks uncomfortably manufactured. As it stands, the courtyard feels unloved and abandoned and does not offer a visually contained area or a strong linear element which the vessels need. While I would like to see the waxed paper vessels in the open, this did not present the best opportunity. The vessels are in boxes for storage and transport and this accidental arrangement highlights the irregular grid pattern and the liminal space between the elements. I decided to present the vessels in three galvanised wire crates. However, on the day I was persuaded to release the vessels from the crates and to display them on a wooden shelf in the gallery. This worked better than I had anticipated. I was concerned that a plinth would force an inapt feeling of importance onto the work. However, the shelf feels part of the construction of the gallery, more architectural than plinth in character. This, together with the texture and warm colour of the wood, works well with the fragile and transient appearance of the waxed paper, intensifying the tactile and quotidian nature of the materials. The structure provides the geometric element and the containment that the work requires. Because they are light, some individual vessels, particularly those close to the edges, have fallen over. I was aware and indeed happy for this to happen. It has dispelled any element of forced orderliness and added to the overall look of the display. 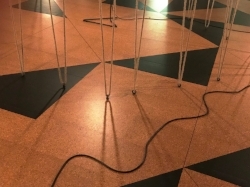 To my shame I had not heard of Leonor Antunes, a Portuguese born artist, before visiting the exhibition at the Whitechapel Gallery. ‘the frisson of the togetherness’ is an immersive experience. At each turn the view is different and conversations between the diverse elements alter. Repeated elements are similar but never identical. There is tension in the tautness of the rope and there is freedom in the bunches of horse harness hanging loosely. I have made work using sisal rope and left it to find its own form rather than put it under tension, so this exhibition opened up new possibilities. I am looking forward to experimenting with leather in my work, a material I have not worked with before. Here hangings of solid panels of leather and hemp rope contrast with netting constructed from finer leather thongs. The formal nature of the grid feels softened by the material. The video on the Whitechapel gallery website shows the artist putting a curve into the shape, but this was no longer discernible in the exhibition. The manner in which each element of the work is constructed is part of the overall appeal. The presence of craftsmen and artisans at one with their materials and tools is felt throughout the show. References to craft traditions are a feature of Antunes’ practice and I look forward to exploring how these together with historical context influence her work. As well as showing an interest in artisanal traditions of the past, Antunes unambiguously pays homage to makers and designers, many of them women, who may have slipped into the shadows. Their names may be used in the titles and their designs incorporated into sculptures. ‘the frisson of the togetherness’ incorporates a floor of cork and linoleum based on a design by British sculptor, Mary Martin (1907-1969). 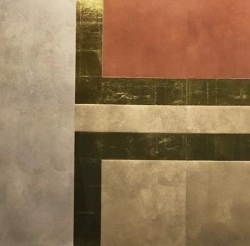 The assurance with which Antunes weaves references to the history of the gallery and modern British art is stimulating and I left the gallery inspired by a complex and subtle exhibition and motivated to get into the studio. Visitors to the annual London Art Fair have an opportunity to see an overwhelming number of works of art presented by national and international galleries under one roof. While the main fair takes place on the ground floor, younger newer galleries primarily showing the work of emerging artists, in solo and group shows, are on the first floor. The subsidised Art Projects have a more contemporary feel and the curation and hang are often less formal. It is here that I found work most inspiring and relevant to the development of my own practice. I was particularly drawn to Osservatorio by James Brooks showing with Canal Gallery. I have been thinking over ways in which to map a favourite a walk and seeing Osservatorio has helped to crystallise some ideas. It was reassuring to see intimately scaled work so effectively displayed. Other works that caught my eye were often prints and drawings where marks of the artist’s own hand are clearly evident such as Nana Shiomi’s woodcut on Japanese paper, which has the added pleasure of the woodgrain highlighted within an otherwise uncomplicated composition dominated by the simple shape of the teabowl. Untitled by Patrick Scott (1921-2014) is eye-catching for several reasons. It is a very large print of a geometric form based on the Japanese kimono. The carborundum clearly shows the brush marks made by the artist, bringing the human touch in contrast to overall ascetic feel of the work. While the print is delicately coloured, it also incorporates gold leaf. The use of gold leaf is another element I have begun to incorporate into my printmaking. The discovery of this Irish artist, previously unknown to me, is timely. The wall label included a passage from Mel Gooding’s book on Patrick Scott giving further food for thought. Presentation and curation have repeatedly come up in my tutorials and I looked out for interesting and unusual displays. Most notable was Chiara Williams Contemporary Art showing In Times of brutal Instability by Frances Richardson, a series of post-it notes, beautifully recreated in curved wood with an added trompe l’oeil pile of carpet made of quick drying cement. 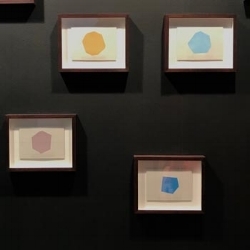 To encourage visitors to move into the stand and to view the work more closely, the gallery sacrificed part of their wall to reduce the depth of the stand. On another stand, Gil Hanly’s photographs were simply and poignantly presented in boxes of photographic papers delicately perched two doweling rods (invisible at first glance). The look was clean and uncluttered, focusing the attention on the relatively small photographs unusually presented horizontally. This was a worthwhile visit, which has given me much to consider. MA Fine Art students spent a day in Alice Holt Forest run by the Forestry Commission. Students were encouraged to bring some materials to work with and the aim of the day was to respond to the site and to think of the forest as a space in which to work, a studio outside the studio. Alice Holt Forest feels very different to the woods I usually walk in. The organised car park, the well-defined and surfaced tracks, designed to accommodate large numbers of visitors, feel alien and a little disturbing. The relief at being outdoors though is the same. Despite the cold, it is a thrill to choose a spot and get to work. I begin with making rubbings of tree trunks, one a yew and one a larch (I think). The bark feels and looks very different but the differences are less marked on the rubbings. The large pieces of paper are awkward to handle in situ but the grandeur of the woods deserves no less. The resulting marks may translate into a screen print to be used at some later point. Next up is the ball of yarn: walking around a small group of young trees, connecting them with the yarn. Is this wrapping? Or connecting? Wrapping, in the way I think of it, has connotations of celebration or adornment, as a mark of respect or wonder. I delight in trees and take pleasure from being close to them. In this case though, I am making connections, in space and through time, in the way of making visible something abstract. On the way back to the car park, we see Cosmos, a carved wooden sphere, measuring two metres in diameter, installed in a carefully chosen site in the forest in 2014. The work was commissioned by The Jerwood Open Forest from joint winners Semiconductor (Ruth Jarman and Joe Gerhardt). On arrival, we had seen the video showing how the work was produced, taking data collected over a year in Alice Holt Forest as the starting point, demonstrating the links between science and art. It is a clear illustration of how data can be translated into an abstract sculpture, how a work of art can be made in collaboration with industry by outsourcing production. Cosmos looks both at home and alien in its setting. The material is in harmony with its setting in a small clearing, acquiring a gentle patina of moss, and yet the form clearly signals its human origin. There is something liberating in the physical activity and the somatic experience of using the forest as a temporary studio. I plan to do more work en plein air.